Preheat oven to 80°C/180°F (convection). Put strawberries, confectioner’s sugar, and lemon juice in a blender and blend until very smooth. Strain through a sieve set over a bowl to remove seeds. Remove the baking sheet from the oven. 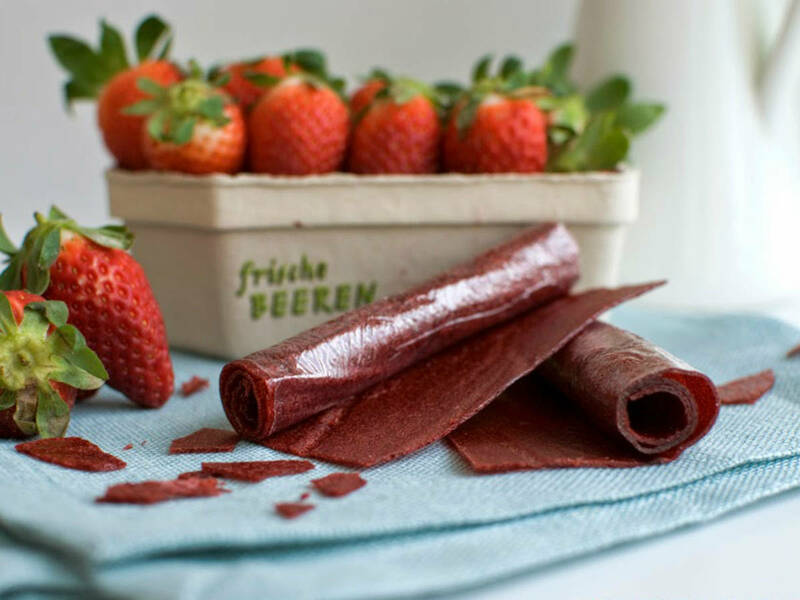 If you used a silicone baking mat, put plastic wrap on top of the fruit leather, then invert and remove the silicone mat. If you used plastic wrap, remove the fruit leather together with the plastic wrap. Cut the fruit leather together with the plastic wrap into rectangles of approx. 10 – 15 cm x 15 – 20 cm/4 – 6 in. x 6 – 8 in. Roll each rectangle up from the shorter side. Enjoy!